When I began university, I had intended to double major in biomedical engineering and French, but I was sold on global studies from the time I took my first global issues classes. This semester, I am interning in DC at the Brookings Institution, working for the former Ambassador to the Czech Republic, and am on track to graduate a year early from the University of North Carolina at Chapel Hill. I am majoring in global studies and French with a minor in Slavic and East European languages and culture (concentration in Polish). Currently, I am in deciding between going into the international relations industry right after graduation or going straight to graduate school. My dream is to work in transatlantic relations, focusing on France or Poland, and I want to get involved with diplomacy and research either through the U.S. Foreign Service or through an internationally focused think tank. 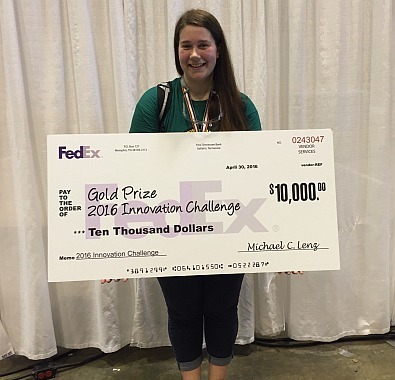 In addition to my leadership role on Team 4828 in regard to presentations and team relations, my team won the Gold Prize in the FedEx Innovation Challenge (at the 2016 FIRST Championship) and that really inspired me to run with my people skills. A feature of our FedEx submission was a “commercial” that showcased the international element of FIRST and the fact that teams come from all over the world, something that nurtured my interest in international relations and allowed me to express this interest creatively. Coopertition and Gracious Professionalism have molded me into the person I am today, as in my opinion, both of these qualities are foundational pieces of diplomacy and successful relations with other people and nations. Last season on the weekends I mentored the team I used to compete with, which was so cool to see all the new kids who are just as passionate as I was at that age. Since I am in Washington, D.C., now and not in North Carolina, me and a few other alums have been in constant communication with the current team members to work on presentations with the judges and for them to practice their Chairman’s Award interview. You shared that you’ve established a great network within the FIRST community – any advice to current participants on how to do that? There is nothing like the family that you have within your own team. Keep in touch with everyone on your team. As we all get older, everyone will be meeting interesting people and creating connections that we can use to find new opportunities. Also, your team mentors are amazing resources (as we all know), and you should always stay in touch with them no matter how long it has been. I am lucky as my dad was one of my head mentors, but I always go back to visit and maintain my relationship with the other mentors who shaped my FIRST experience. I wish I had made a bigger effort back when I was competing in FIRST Robotics Competition to network more with the judges and the other mentors of teams in my region, as they are all also industry leaders who are well-connected. I would advise current participants to take advantage of the moments they have to interact with them and form relationships that will allow you to meet more people and learn about unique opportunities.